Today's guitar wiring project is something really simple. There's no potentiometers, only switches. For some of you it can be an advantage. The wiring is simple in mount, and also simple in use. No pots, means no treble losses caused by them. 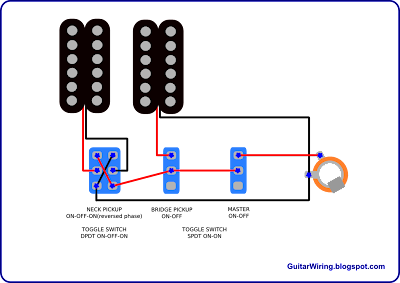 Switches in the wiring: neck pickup on-off-on (second „on” is reversing the phase); bridge pickup on-off: master on-off. If you like to play on two pickups together, the reversed phase function will give you a new, extra tone. As I said, it's simple. Hot paths - red wires - are going from humbuckers to their on-off switches, than to the master guitar signal on-off, and to the jack socket. The neck pickup can work with reversed phase. Its switch got three positions: on - off - on2 (reversed phase). The phase reversing function works especially well, when the neck pickup is working together with the bridge p-up. The master on-off function will allow you to kill the guitar signal quickly. You can use it just to turn-off the guitar (stand-by), or as a kill-switch. To make this wiring, you need three mini-toggle switches (beside common parts): one DPDT on-off-on, and two SPDT on-on. The wiring is quite „bright sounding”. There's no pots, so there's no treble losses. It can be very solid, if you will use good quality switches.